On February 15, 2018 March 7, 2018 By felicitousfelixIn Are There Lesbians? This book, dear lord, this book. It took me so long to read – to the point where I would pick it up and The GF would say “Oh god, are you still reading that?” We’re both suffering for my art here, and you, dear readers are the only winners. It’s not a particularly bad book, just no great literary work. Primarily, of course, it is a diary, and unlike earlier, Renaissance texts, Anne Lister’s diaries were not meant to be read by others. This clearly shows in the writing as the entries are extremely straightforward and not overly given to description. That being said, Anne Lister had a good eye for detail and provides a very thorough account of her daily comings and goings, even if she does lean towards listing (nominative determinism perhaps?) The edition that I read is edited by Helena Whitbread and despite the hard work it took me to get through what she has provided, I would have liked a little more. There are a few good summaries of intervening periods of Anne’s life which are not included, as well as explanations of what is happening in certain entries. However, Whitbread has chosen to end the book when Anne goes on a trip to Paris, and from there she provides a summary of Anne’s life and then some obituaries. Perhaps it is the historian in me, but I would dearly have loved for this book to be a complete translation of Anne’s diaries, rather than just providing a window into a section of her life. I suppose now there is nothing for it but to go to England and translate her code myself, as this edition seems to be the only one available commercially. Anne Lister was not a particularly nice person, which may have been part of why her diaries were so hard to read. She is extremely elitist and holds both herself and others to very high standards, looking down on those who don’t meet them as “vulgar”. If I had a dollar for every time Anne describes someone as “vulgar” I would be very rich right now. She does seem like a worthwhile friend to have and it seems that, while they held her interest, she was quite attentive to her few female friends and lovers. She does appear to have been reasonably fickle however and her feelings could cool quite rapidly. She was an extraordinarily accomplished and well-read woman who spoke several languages and helped run much of her family’s estate. What I found most interesting about the diary entries however, is that Anne herself does not seem to feel any religious concern over her sexuality. She attends church for both social and religious reasons and, while she does not appear particularly devout, she frequently describes herself praying and seeking forgiveness of her sins. Her sexuality is never described by her as a sin. Anne’s main struggle with her sexuality is the gossip that she must suffer because of it, as well as the heartbreak it causes – something that happens whatever your sexuality. I firmly believe in the studying of history and the power of knowing where we, as a people come from. 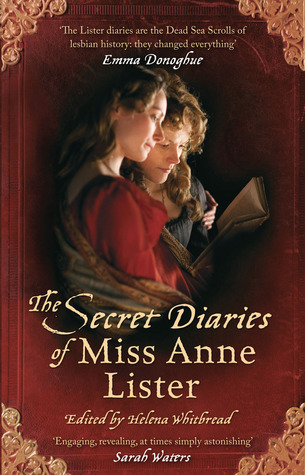 For that reason, The Secret Diaries of Miss Anne Lister is a worthwhile read, as it gives us a peek into a woman’s everyday life. As a literary diversion however, the diaries are seriously lacking, and if you are looking for something fun to read you will probably want to look elsewhere.